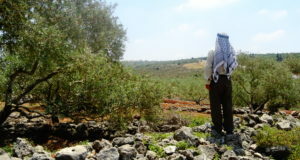 On Thursday, May 15th 2008, farmers from Deir Istiya noticed bulldozers and diggers working on their land close to the illegal Israeli settlement Revava. As they investigated closer, it became clear that the Municipality of the settlement had employed a private construction company to raze land for a new housing unit for the settlement. At least 200 dunums belonging two 10 families from Deir Istiya are effected so far. The land is partially planted with olive and tamarind trees. It is also used for grazing and collecting wild plants. However, Israeli settlers and army have prevented Palestinian farmers from planting their land close to the settlement since the late 1990s. In the days following their discovery the farmers from Deir Istiya organized to gather the legal papers that prove their ownership and filed a complaint with the Palestinian DCL (District Coordination Liaison). As a result, the work stopped for a couple of days. However, on Monday morning, the 26.05.2008, a digger began once more to raze their land. About ten farmers spontaneously went to physically stop the work themselves. 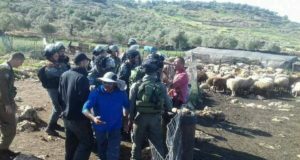 The digger driver stopped working as they approached and a discussion ensued between the farmers, the officials of the construction company, Israeli security personal and the Mayor of Revava. Two team members of IWPS and two women from the Israeli group, Yesh Din, who where called by the farmers, joined in about an hour later. The Israeli DCO (District Coordination Office) was informed right away, but took almost three hours to arrive. At that point the mayor had ordered the worker to start digging again, arguing it would cost him too much to pay for the construction company while continuing to wait for the DCO. He even threatened one of the farmers to file a law suite against him for the extra costs caused by their disruption. He also claimed to be a “gentleman” unlike the Palestinian farmers, who’d better file a legal complaint at the appropriate legal institutions instead of disrupting the work in such an uncourteous manner. In response, one farmer said that it is their land getting destroyed and that they not only already filed an official complain but also want a compensation for the damage already done. The Palestinian farmers refrained from physically blocking the digger and waited for the DCO to arrive. However, Captain Rafi from the DCO finally arrived, he did not order the work to stop, but argued the Palestinian farmers first have to bring the papers supporting their claims. 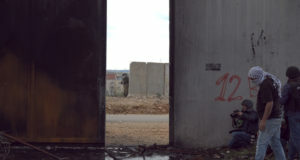 He then retreated into his jeep in order not to have to discuss with the farmers or the international and Israeli activists. A farmer went back to the village to bring some of the papers and the Palestinian DCL in Salfit was also informed to come with the documents already given to them. As Captain Rafi repeatedly ignored requests to stop the digger from creating new facts on the ground before it is clarified who is the owner of the land, the farmers lost their patience and courageously blocked the digger with their bodies. After a short stand off the DCO official finally ordered the work to be stopped, but the constructor just send the digger to continue its work at another place a couple of hundred meter away closer to the settlement. Finally, Israeli police arrived and took the ID details of both, one of the farmers and the Israeli constructor. Once the Palestinian DCL officials arrived, the work was ordered temporally ceased until the Israeli DCO assesses the different papers provided by the Palestinian farmers and Revava municipality. As the farmers do not trust this temporary victory will keep for long and have little trust in getting their rights protected by the Israeli authorities, they are planning to closely monitor the construction side and, if necessary block the bulldozers with their bodies again. As an act of defiance and to assert their ownership rights, they also plan to plant olive trees on the razed land.